If you happen to live in the green, wet village of Rosario, Mexico, in the state of Sinaloa, “almost bubbling with humidity and the smell of mangoes,” a place where the river goes on a shopping spree and grabs up turtles, chickens, cows, old cars and washing machines; where mummified monks occasionally pop out of cathedral walls; where vast sections of silver mines are known to collapse and take part of the village with them; and where the village’s inhabitants have no discernable conscience—if you happen to live there, you’d better watch out: Mr. Mendoza, the man with the paintbrush, has come to visit. After what may have been a celestial apocalypse, there is found, among other things, the ghastly remains of a mummified monk—obviously an evangelist, as signified by the way the bones of his second finger point heavenward—and painted on his chest is this warning: “How do you like me now? Deflated! Deflate your pomp or float away!” Yes, Mr. Mendoza, with his paint-dripped commentary, is everywhere. And then, one day—maybe the day the villagers had been praying for—Mr. Mendoza decides he has had it with them all: “Social change and the nipping of complacent buttocks was my calling on earth,” he announces, and a few days later, “with a virtuoso’s mastery,” he leaves. Dramatically, magically, in a way no one would have or could have suspected, but to everyone’s applause. Have the villagers learned their lesson(s)? Probably not. 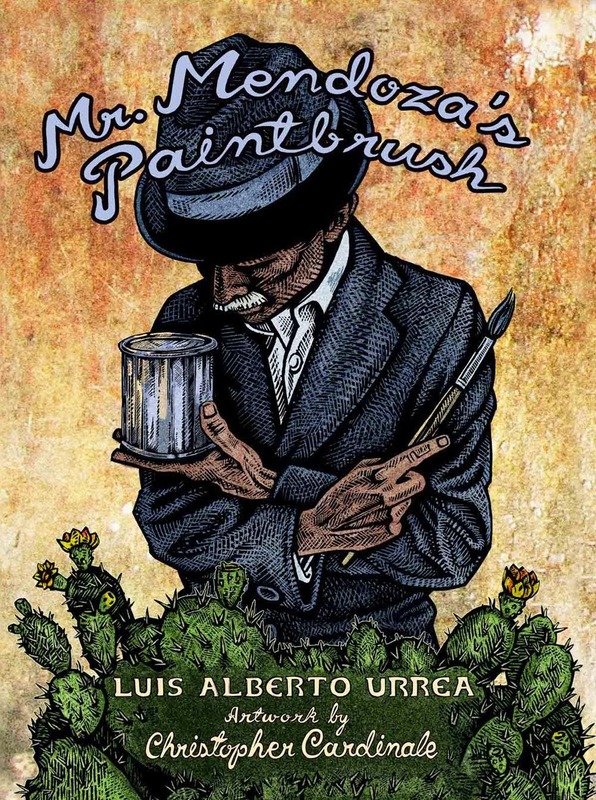 Cartoonist and muralist Christopher Cardinale’s detail-rich illustrations, in a woodblock style of dark, muted earth tones, with lots of shading and thick black lines, enhance the surrealism of the story. There’s more than enough gore and grit to grab adolescents—especially boys—who don’t especially enjoy reading but are drawn to graphic novels. In a high-school classroom involving adolescents of both genders—or even with younger students—this part horror story, part morality play, part pure grisly fun, can catapult a discussion about how boys treat girls and the consequences of behaving badly. 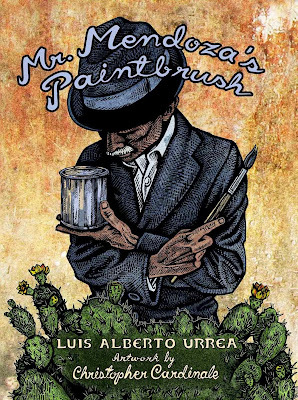 Mr. Mendoza’s Paintbrush is highly recommended.